Do you know how to properly set up your car dealer website to be search engine friendly? And especially how to target your local area properly? The old saying “The grass is always greener on the other side of the street is often true” and that’s also often said about car dealer website providers. So lets assume you have a car dealer website but are not happy with it for one reason or another and want to contract with another provider. It’s as simple as calling another company and getting signing up. Most car dealer website service providers are staffed with former car salesmen who know the business. This makes for an easier sale since knowing the business they can usually answer any questions you have. The dealer website salesman will connect you to a virtual presentation and show off all his company has to offer. Then will ask for your order by asking you “which credit card are we going to use to set this up?” and your a done deal. From that point on your account is set up by the car dealer website company’s IT guys that do all the setup work. As a rule these guys do not know the car business. They are IT people that mostly know code. It’s important that the dealer who is buying the service knows how he want’s his car dealer website meta tags setup, or has someone that does know how the website should be initially setup for proper meta tags and description. There are two providers i wouldn’t touch with a 10 foot pole. They are the cheapest in the bunch, and the old saying “you get what you pay for is true!” To the untrained eye all car dealer websites look mostly the same. But it’s how a car dealer website is presented to a search engine that matters the most. You wouldn’t believe some of the generic meta seo that I’ve seen. Some providers use essentially the same generic meta on all their car dealer websites. No specific targeting the dealers area or specific meta that’s investigated first before the site goes live and is submitted to search with gross errors. 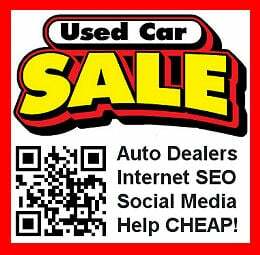 Some bargain basement entry level car dealer websites do not have ANY SEO! Oh.. you want that too? the salesman might say later on after you signed up and cant find your cars in search. We will have to upgrade your package to get that. OUCH! Don’t get caught in the trick-bag because you didn’t know any better. Just like your sales people, the car dealer website salesperson did his job and sold you his companies product. The price sounded really good and you bought it because the sales pitch sounded good. I can be your consultant to get the best website for the least amount of money. Car dealers know the car business. IT and web guys know the internet. I am both rolled into the best car dealer website consultant you can find.